Continue reading "Videos of Ignite Philly talks published"
Continue reading "More Ignite Philly photos via Flickr"
Continue reading "We went, We spoke, 300 listened"
Continue reading "Presenting our case for House Plans at Ignite Philly"
London based financial newspaper Financial Times covered modern home plans this weekend in an article called Affordable Flair by Tracey Taylor that appeared in their House & Home section. Best part is the article featured our house plans and included quotes from myself, and one of our customers and photos of their Plat House. Its always nice to see modern house plans get coverage, and even better to see our customers proudly show their house and the hard work they've put into them. What made this really unique is that the Financial Times is a UK based publication. More or less they don't have house plans for sale in the UK. House plans are a uniquely American phenomenon. Houses elsewhere in the developed world are almost universally designed by architects. Its only here in the US that our frontier heritage and value of personal freedom has retained in most states the right for an individual to design their own house, and the strange distortion of that which is the right to have an unqualified person design your house. For better or worse its why house plans exist as an industry in the US, and also why the residential built environment is so poorly designed. As regular readers here know, our house plans are all about combatting the sorry state of the status quo by delivering good design to the market place using the very means responsible for its sorry state. For any visitors from the UK who have came here via the Financial Times article, that is the short explanation of what this odd product house plans are about, and that's why an architect who might otherwise have other battles to fight might take this up as his cause. For us locals you can see the Financial Times article here. 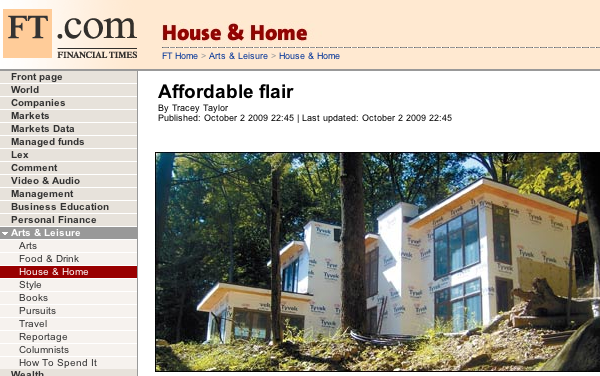 Continue reading "Financial Times covers modern house plans"